PRODUCT. PRODUCED FROM EXPLODED WOOD FIBERS.. WILL NOT SPLIT OR CRACK. Durable wooden clipboards serve as a portable desk. Dark Brown hardboard is engineered wood product specified by architects/engineers in premium designed subsurface bathrooms and kitchen applications of luxury custom built homes. Furniture component. Dark SBS hardboard is TWICE as strong as commodity grade lighter tan hardboard. Premium Dark Brown Hardboard Clipboard. CHECK YOUR LIST ON A CLIPBOARD. SMOOTH WRITING SURFACE ACTS AS STABLE DESK WHILE YOU WALK THE WALK. HOW MANY MILLIONS OF FRENCH FRIES HAVE BEEN INVENTORIED USING A SIMPLE WOOD CLIPBOARD? 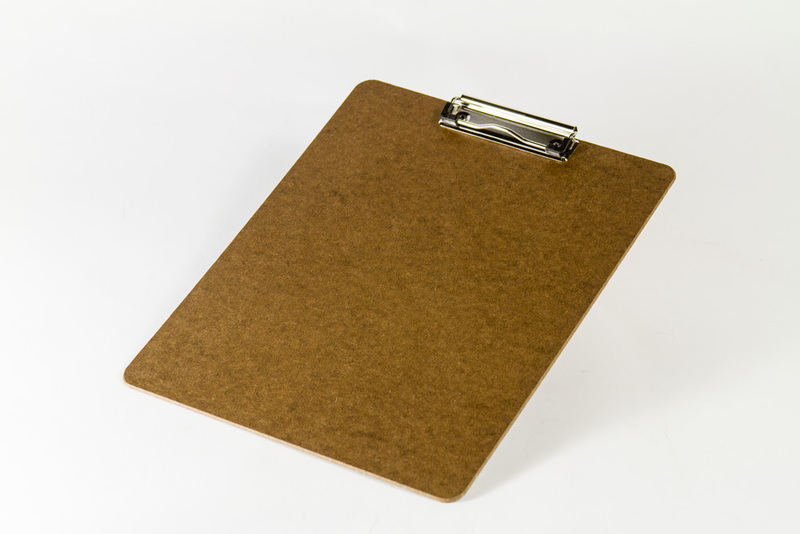 Does your store have worn greasy clipboards?. Please UPGRADE now! STRONG METAL SPRING CLIPS LOW PROFILE AND WAREHOUSE BUTTERFLY.. YOUR CHOICE. .Low profile metal clip preference is growing.. Smooth, durable hardboard surface for 8.5 x 11 documents. Letter size wood clipboard. For half page 8.5 x 5.5 documents, metal clip low profile. Wood Clipboard.